First week of April was spectacular for stocks as the S&P 500 increased 2.06%. On Friday, the stock market applauded the solid jobs report. S&P 500 increased 0.46%, Nasdaq increased 0.59%, and Russell 2000 increased 0.96%. The VIX fell 5.6% to 12.82. VIX doesn’t have much room to fall. S&P 500 is now up 15.39% year to date. The calendar year just happened to end right after the stock market bottomed. Usually stocks don’t crater in December as it is historically the best month of the year. That makes this type of rally, where stocks start the year oversold, unusual. That’s not to say stocks aren’t overbought by now because they are. CNN fear and greed index is at 74 which is just 1 point away from extreme greed. That being said, I don’t think the stock market being overbought will prevent it from reaching a new record high this month. S&P 500 is only down 1.3% from its September peak. 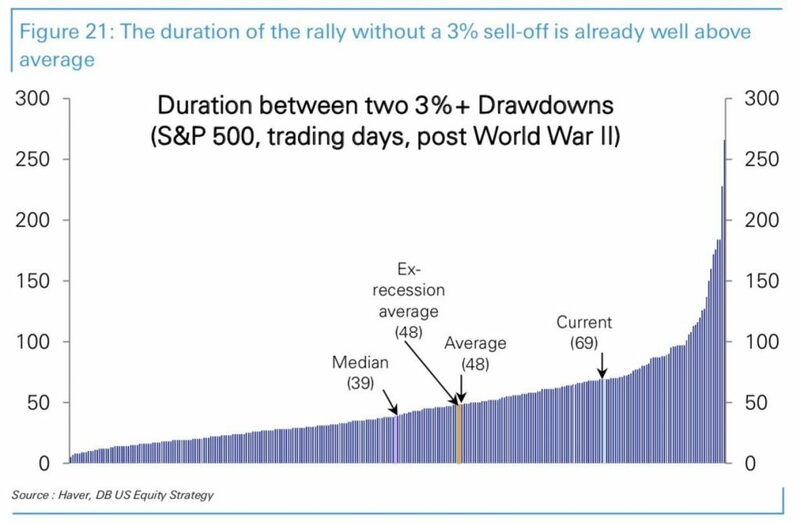 As you can see from the chart below, the S&P 500 has gone 69 days without a 3% selloff which is 21 days longer than average. I don’t see a 3% decline in the immediate future as stocks appear to have enough momentum to pass last year’s high. As of Friday morning, the S&P 500 was up 22.5% from its Christmas Eve low. There have been 44 up days and only 25 down days. There have been 10 days where it has increased more than 1% and only 2 days where it has fallen more than 1%. Every sector was up on Friday except materials which fell 5 basis points. 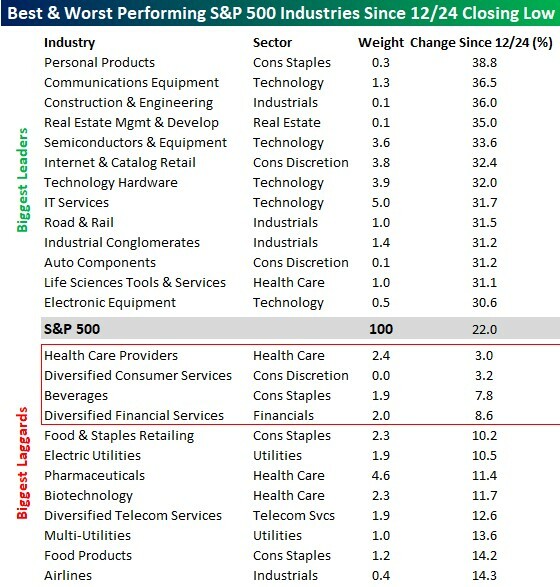 The best 2 sectors were the utilities and energy which increased 1% and 1.69%. It’s unusual for the utilities to lead the market when it is having a very strong day. This might be an oversold rally as the sector was down 2.37% since March 26th. Utilities were helped by the 10 year yield’s 2 basis point dip. The 10 year is now 16 basis points above the 2 year yield. As you can see from the table below, personal products, communications equipment, and construction & engineering were the biggest industry leaders since Christmas Eve. They were up 38.8%, 36.5%, and 36%. It’s unusual for consumer staples to be a big winner in a sharp rally. Technology hardware and IT services have the biggest weighting in this leaders category. Only 4 industry groups haven’t increased over 10%. That makes this rally look like the rally off the March 2009 bottom even though there wasn’t a recession in 2018. So far, the late 2018 to early 2019 economic slowdown hasn’t been worse than the late 2015 to early 2016 slowdown. Stocks rallied before economic growth was sure to have been resuming in the first half 2016. This time stocks have rallied before economic growth has troughed. One of the big misnomers in the past few months was that there was going to be an earnings recession in 2019. Earnings estimates fell (in the first 2 months of the year) the most since the last slowdown which included an earnings recession. This potential earnings recession looked worse because the weakness was broader based. However, it turns out that stocks were right to rally as the bleeding in estimates has stopped. From March 1st to April 4th, the estimates for Q2 EPS growth fell from 2.32% to 2%. That’s a very small drop compared to what we saw earlier in the year. Earnings estimates were low, but revenue estimates were high. 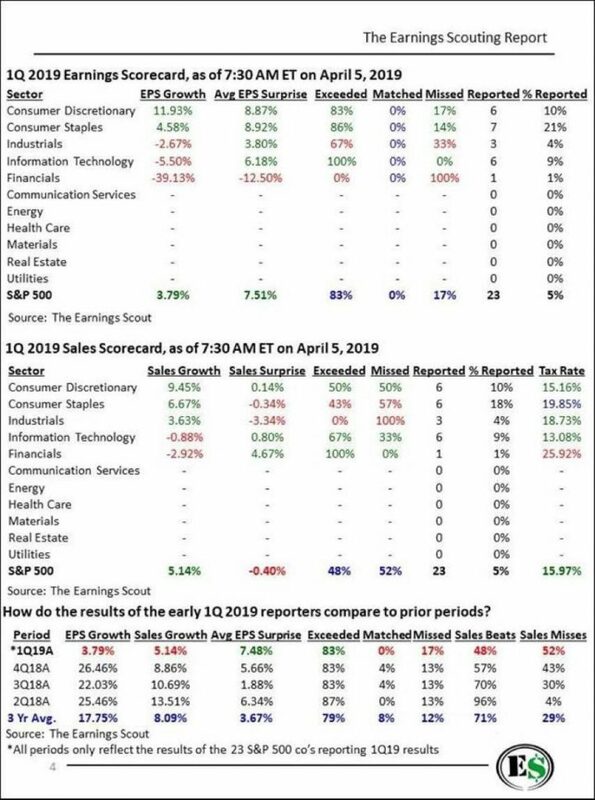 That explains the table below which shows out of the first 23 firms to report Q1 earnings results, 83% beat EPS estimates and only 48% beat sales estimates. The average EPS surprise is a remarkable 7.51%. As the bottom of the table shows, the average surprise beat at this point in the quarter is only 3.67%. The EPS growth rate is only 3.79%, but that’s great when expectations were for an earnings recession. On the other hand, revenues haven’t been solid as only 48% of firms beat estimates and the sales surprise was -0.4%. It’s rare to have negative surprises. The 3 year average EPS beat percentage with 23 firms reporting results is 79%, so it is 3% above average. 3 year average sales beat percentage is 71%, so it is 23% below average. The economy will likely recover in the 2nd half of 2019. Depending on how bad Q2 and Q3 get, this slowdown might not end up being that severe. That makes the 20% decline in Q4 2018 look like a big mistake and the rally this year look smart. 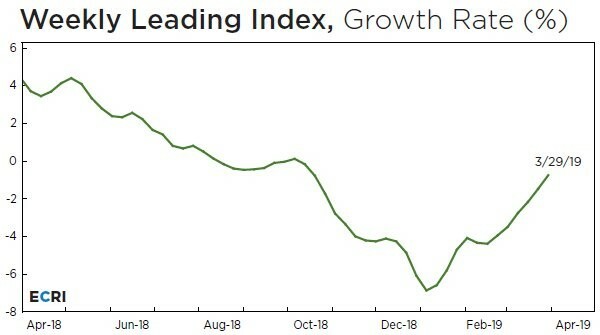 As you can see from the chart below, the ECRI leading index’s yearly growth rate improved from -1.5% to -0.7%. The index increased 0.5 points to 147.2. It peaked in early 2018 slightly above 152. The increase in the growth rate has been helped by the index increasing and the easier comparisons. If the growth rate increases the same amount next week as it did this week, it will be positive for the first time since last fall. This index suggests the economy won’t go into a recession in the first half of 2020. That’s an interesting proposition because when the yield curve was starting to invert earlier this year, many economists were starting to call for a recession next year. Stocks are on a rampage. Normally, I would call for a correction, but with stocks so close to reaching a record high, I think they will increase in the near term until that record is beaten soundly. Not all economic reports signal the economy is doing well. For example, the durable goods and ISM non-manufacturing reports were weak. However, stocks are always worried about the future and not the past. My favorite leading index suggests growth will improve late this year. That makes me optimistic about medium term stock returns. By the time everyone sees the recovery, it will be time to start thinking about selling equities.